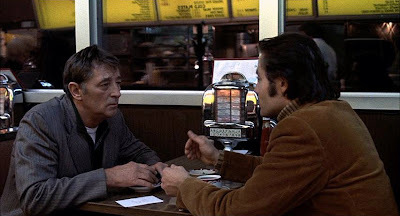 The Friends of Eddie Coyle is out on DVD today in a wonderfully restored digital transfer by the Criterion Collection. The story of Eddie "Fingers" (Robert Mitchum), a gun-runner for the Irish mob facing another stretch of jail time in late middle age, is based on a popular novel of the same name, by George V. Higgins, a former Assistant District Attorney. Rumored to be a roman à clef describing some of the Boston area mobsters he encountered as an ADA, Higgins' tale captures the furtiveness and paranoia that many convicts live with on a daily basis. With morally ambiguous characters in an equally shady milieu; deceptively naturalistic photography that is still elegantly composed; and the conflux of different generations of actors unique to the era of its release, the movie represents all that I love best about seventies cinema. 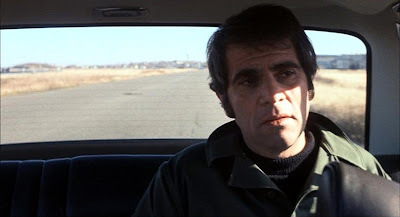 A crew led by Eddie's friend, Scalise (Alex Rocco), is knocking off banks using guns Eddie purchases from upstart gun dealer, Jackie Brown (Steven Keats). 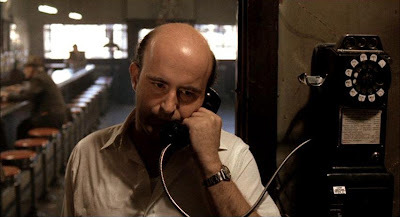 But Eddie's distracted by an upcoming sentencing for a crime he committed based on the recommendation of another associate, Dillon (Peter Boyle). As Eddie tries to string a young cop, Dave Foley (Richard Jordan), along with information - hoping to get the cop to speak up for him in court - he spirals down a path that will ultimately box him into a corner. 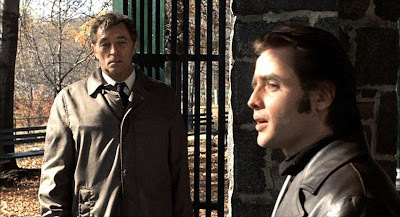 Director Peter Yates (Bullitt) and cinematographer Victor J. Kemper seems to be utilizing the natural light when shooting most of the movie, grounding the film in a "true crime" sort of aesthetic. But this film is a noir if I've ever seen one. With Eddie desperately running out of time as the sentencing approaches, look at the shot above and how it is framed. Eddie is flanked by bars on one side, and the autumn landscape on the other, both reminders of the dilemma he faces. Cop Foley may be in the same shot, but he is separated from Eddie by the clear line of demarcation where the bars meet the wall behind him, demonstrating Foley's detached attitude towards Eddie's predicament. Jordan's Foley is just as seedy as the snitches he often deals with. Jordan (Logan's Run) was a dynamic young actor able to hold his own with screen heavyweight Mitchum. 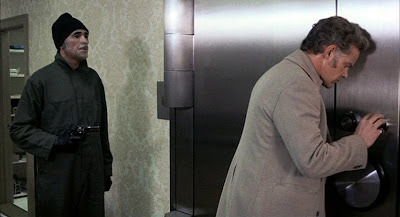 They would soon work together again in Sydney Pollack's The Yakuza (1974). 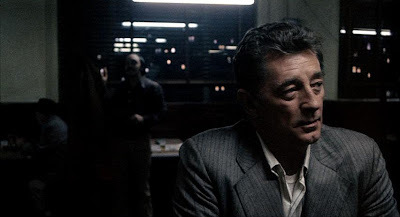 But the casting of these actors, along with Boyle and Rocco, highlight the flashpoint that was the seventies, a moment in time when one could have talented new up-and-comers like Jordan paired with veterans like Mitchum, with stalwart character actors backing them up. Rocco had already famously appeared in another seventies film that benefited from the same approach to casting. In The Godfather (1972), he played the part of Moe Greene alongside a cast of rising thespians, led by Al Pacino, which competed with veterans, like Marlon Brando and Sterling Hayden, for the audience's attention. The conflicting acting styles, the younger generation's Method versus the older generation's classic stagecraft, with the character actors at their most naturalistic, created a verisimilitude that was characteristic of seventies American cinema. Coyle's conclusion displays a certain symmetry that is rarely attempted in today's films. As Eddie tries to run a shell game on the cop, playing confidential informant only insofar that it gets him a get out of jail free card, he has no guilt over making his competition, gun dealer Jackie Brown, the fall guy in the situation. Little does Eddie know that another of Foley's far more experienced informants has the same in mind for him.